The northern part of the Adriatic Coast of Italy is famous for its summer-holidays towns like Jesolo, Caorle, Bibione and Lignano Sabbia d'Oro. While enjoying the beautiful blue sea and its related charms, holidays in this area can be an opportunity to discover the history, art and culture of some of the smaller towns like Portogruaro. Portogruaro started as the river port for an ancient Roman town called Concordia, located 6 km away. However, with time it became bigger and more important than its parent town. One legend says that the town was built with the stones of the ruins of Concordia-Sagittaria after the parent town was destroyed by Attila the Hun in the 5th century. 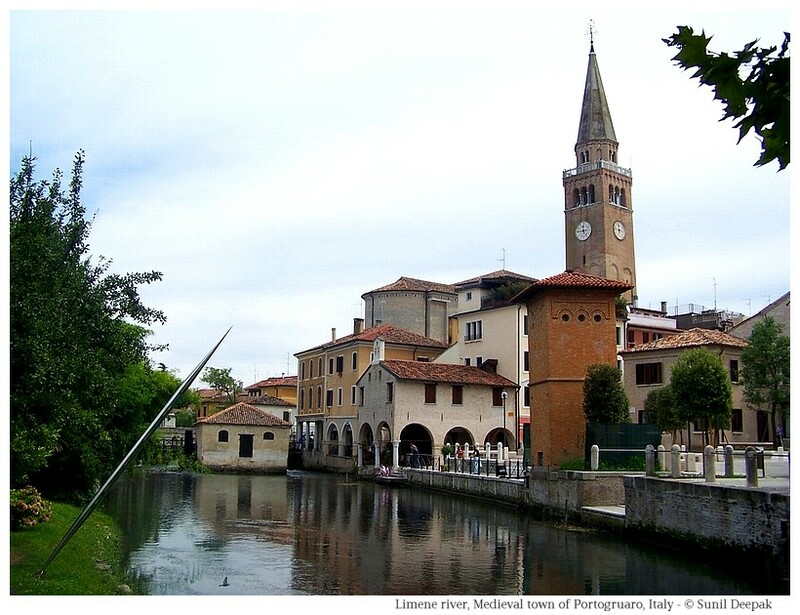 The first historical document mentioning Portogruaro is from 1140 CE in which the Bishop of Concordia gave permission to some merchants to build a port on the Lemene river. Another document from Pope Urban from 1186 CE also talked about the prosperous Port of Gruaro and its mills, thus by that time the city had already started to grow. In 1420 Portogruaro came under the protection of Republic of Venice. In 1797 it became part of the French dominion of Napoleon who gave it away to the Austrians. It remained under the Austrian rule till 1866. 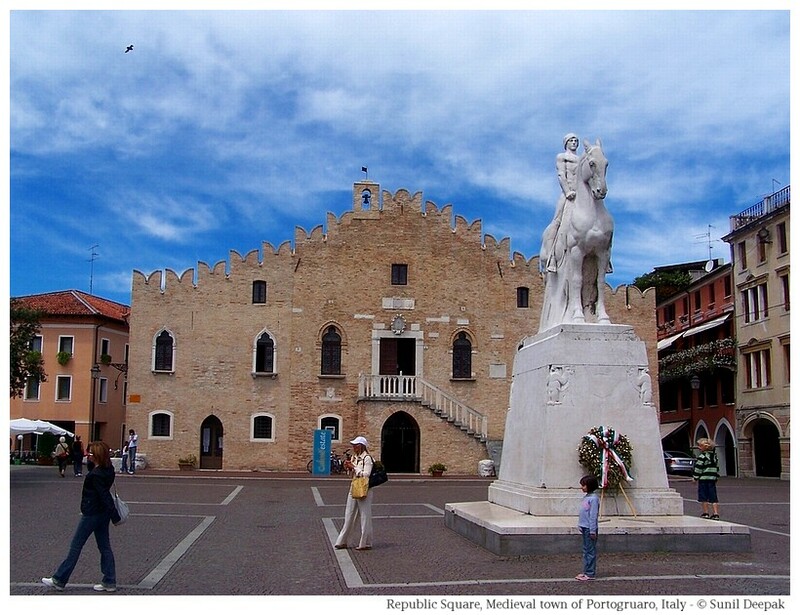 Some statues of the Venetian lion in Portogruaro were destroyed by the French while during the first World War, some of its buildings and bridges were damaged by the Austrians. 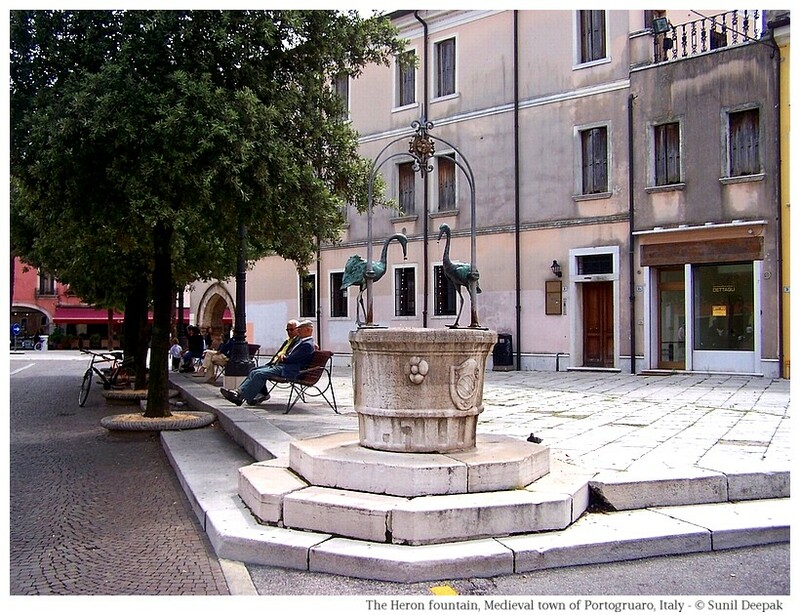 The square has an old well like fountain called Pozzetto del Pilacorte - it has two herons that are a part of the city's official symbol (in the image below). 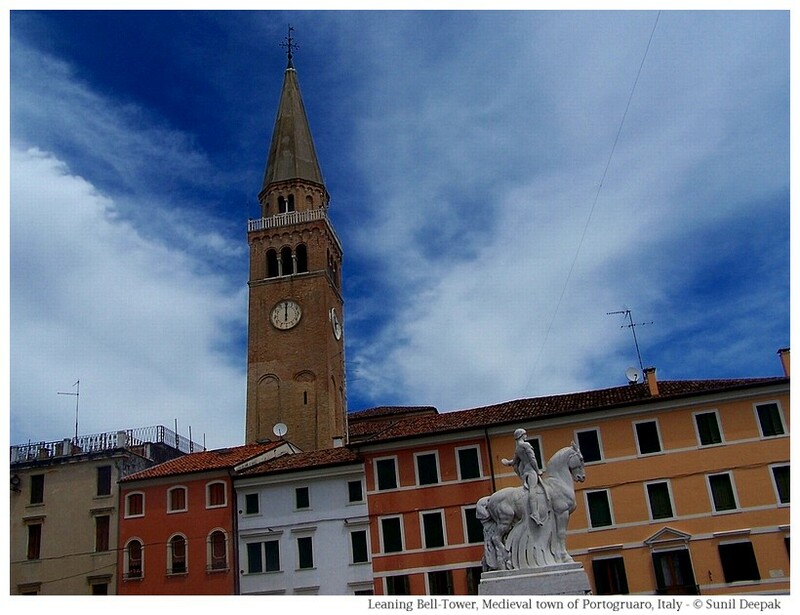 Just behind this square is the Cathedral of Portogruaro with its leaning bell tower. The cathedral is dedicated to St Andreas (in the first image on the top). The Municipal building, the leaning bell tower peeping from behind the old houses surrounding the square, with their "bifora" and "trifora" windows in Venetian styles, and the white coloured soldiers' monument, all combine to give this square a very distinctive look. The city has two main roads on the two sides of the river with small streets going out like the teeth of a comb. This means that walking around the city you can frequently meet the river and its canals and see some of the old medieval bridges, that give this town a very distinctive ambiance. 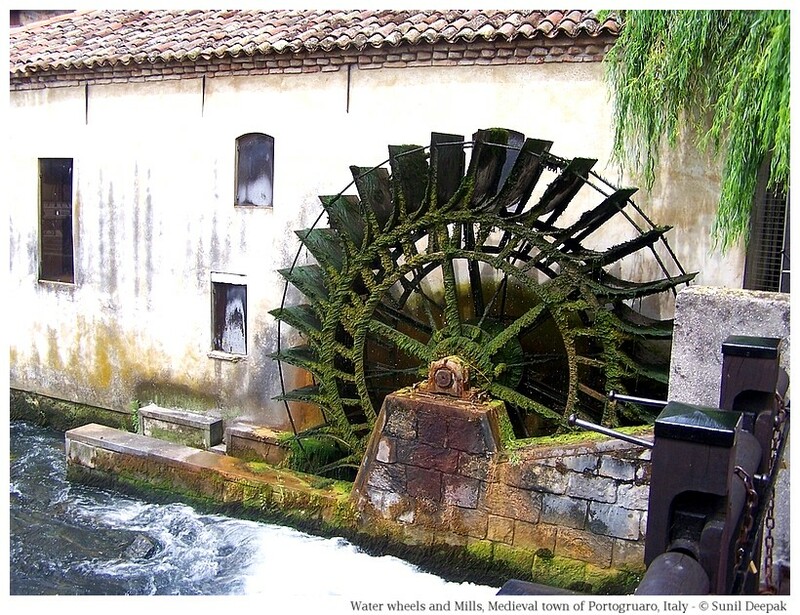 From the bridge on the river Lemene in the city centre, you can still see the water-wheels used for the mills that lined its banks in the medieval past (in the image below). Portogruaro, has many other buildings of historical interest including the medieval towers guarding the entry to the city. It also has some museums including the City Museum and the Archaeological Museum. Portogruaro is a tiny river town with medieval houses, a lovely square with interesting architecture and a leaning bell tower. 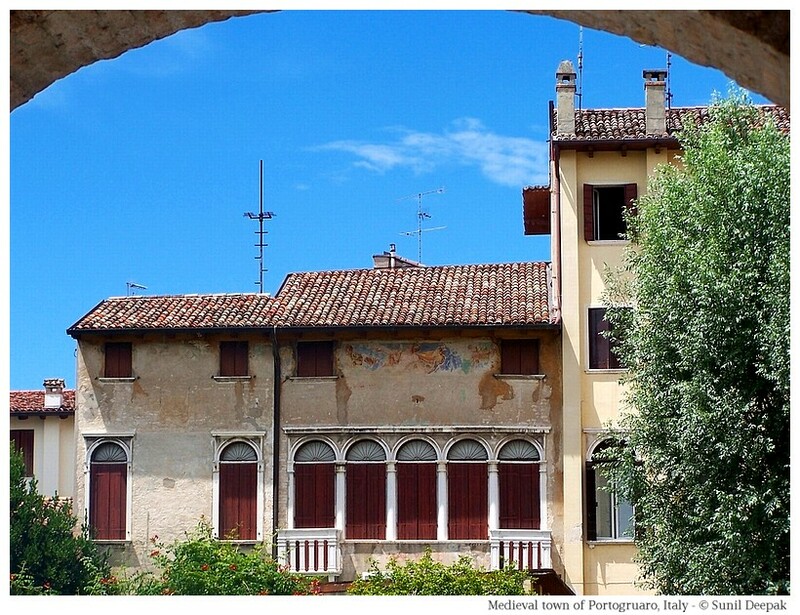 If you are on holidays in this north-eastern part of Italy, Portogruaro is worth a visit. Nice to read. Awesome photos.